Show your support for any awareness when you wear our Believe Personalized T-Shirt. This great t-shirt is the best Team Apparel at your next walk event. Just add your special, three line custom message on the back to show your support for a yourselves or a loved one fighting for a cure. 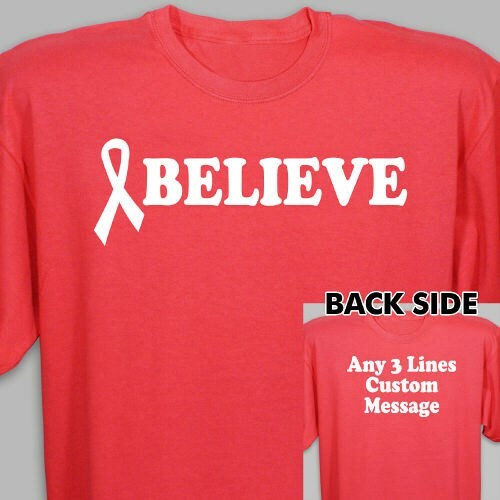 Our Believe Awareness Shirt is a great way to support the fight for a cure. This Personalized Awareness shirt is available on our 100% cotton shirts, machine washable in youth sizes XS-L and adult sizes S-3XL. Free personalization of any three line custom message and text color is included. Additional Info Wear red to show your support for Heart Disease Awareness and for a Cure for AIDS. MyWalkGear.com is your number one spot for all awareness gear & walk apparel.